If you have been following my blog for even a little while you probably have noticed how much I enjoy Indian food. Today is just another example of why I like Indian food so much. I’ve been making this meal for so long that I honestly can’t even remember how I came up with the recipe because korma isn’t even my favorite thing to order at Indian restaurants. I don’t think it has very much flavor at my favorite Indian restaurant. But this chicken korma coconut milk recipe has lots of flavors when made at home. This is a great dish to share with family and friends. I really enjoy the flavor that comes with this dish. It is approved by the picky eaters in my family too. I’ve made this about a hundred times. It’s filling, flavorful and easy. Plus, my whole family loves it and it’s a lot healthier and cheaper than eating out. I’ve noticed the trick to getting lots of flavor out of this dish is to make sure and let the spices bloom in steps 9-10. This is an important step not to miss. I decided to soak the coconut and cashews before making a paste out of them so that they would be smoother. Then I blended it with the coconut milk to make a nice smooth sauce that would thicken the dish nicely. My favorite Indian restaurant serves their coconut korma with golden raisins in it. It adds a little sweetness to the dish as well as a nice texture. The raisins plump up when cooked, so I added it to the dish as well. 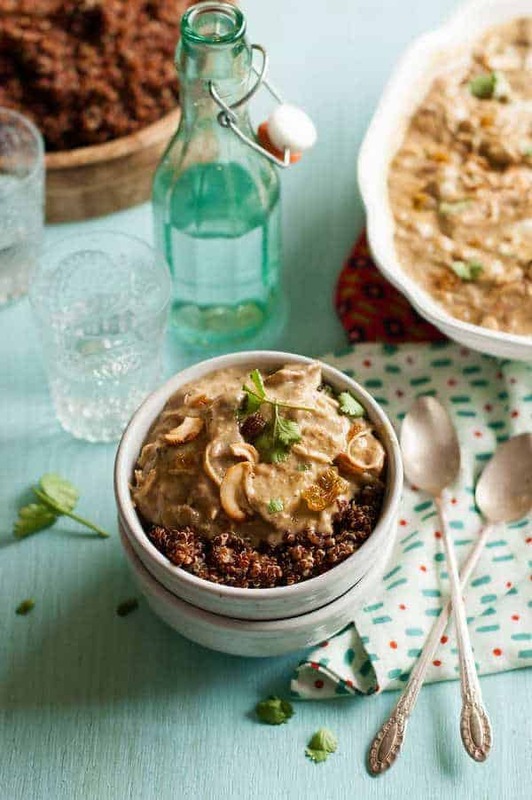 It is really delicious served on top of red quinoa; however, you can put it over jasmine rice, cauliflower rice or another preferred grain of your choice if you would like. You could use chicken tenders or chicken breasts instead of chicken thighs and it wouldn’t take nearly as long to cook, but I really like the depth of flavor you get from the chicken thighs and I really like how tender they get when you cook them for a really long time in the oven. I took the traditional clean chicken korma recipe above and simplified and American-ized it. I cut out several of the steps and it doesn’t taste quite the same but it’s so much less work and it doesn’t require you to prepare ahead of time, so hopefully, you’ll appreciate the time savings. I know I do. In fact, I’ve made this clean chicken korma recipe a few hundred times. Yep. You heard that right. When I find a recipe I like, I make it a lot. The fact that my two oldest children love this recipe too, it makes me make it even more often. One of my daughters doesn’t like it because it has chicken in it. She won’t eat anything with chicken in it so she really doesn’t count. My other daughter is five and doesn’t like how spicy I make it. I don’t blame her. I like it really spicy. You can totally customize the spice level yourself though by the amount of red pepper and the type of fresh chilies and whether or not you include the seeds (leave out the seeds if you don’t like the heat). If you don’t like it spicy, don’t put any red pepper in. If you like it spicy, pretend it’s salt and sprinkle it all over the place. 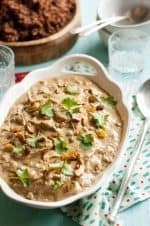 I must warn you that I’ve only tried this chicken korma coconut milk recipe with Spice Hunter spices. They are so much better than any other spice I’ve tried. They actually have flavor. So, just beware that you are welcome to use whatever spices you have, but the recipe may turn out very different for you. This version looks different than the images on this page because mine is a lot more yellow because I really like the turmeric and red pepper. But you can always put less in so it’s not as bright as mine. One of the ways I simplified the whole process was I don’t make a coconut paste to blend with the coconut milk (who has time to soak cashews for 4 hours?). This makes it a thinner sauce, instead of thick like the image, but it still tastes almost as good. I should also say that the spices are approximate. I never measure mine. I just put how much I feel on that day. If nothing else, it gives it a little variety of flavor. Now that I have my Instant Pot, I make this almost exclusively in it. All the ingredients are the same. It’s just a different technique. It turns out different from the images too. It’ssoupiery and the chicken is really soft, a lot like it would be in a crock pot. 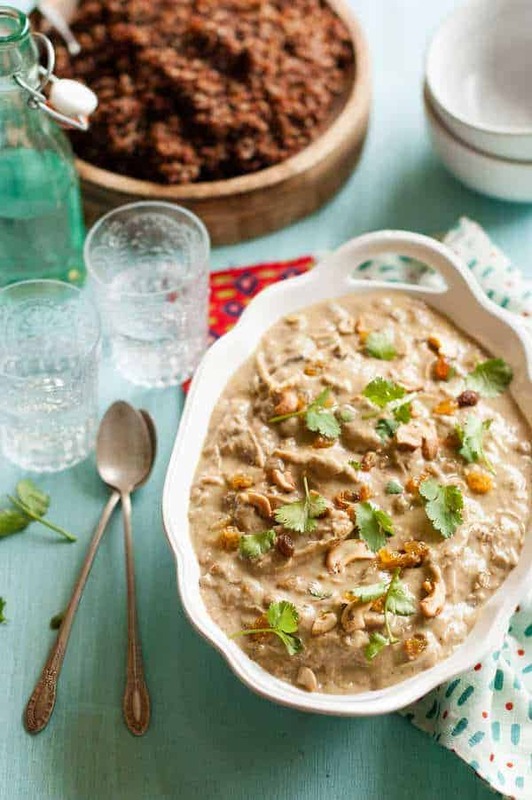 I hope you and your family and friends like this dairy-free chicken korma recipe as much as I do. I love love love it! Please let me know which version of clean chicken korma you like better and if you like it as much as I do. I would love to know if you try this recipe. Please comment below and let me know how it turns out! 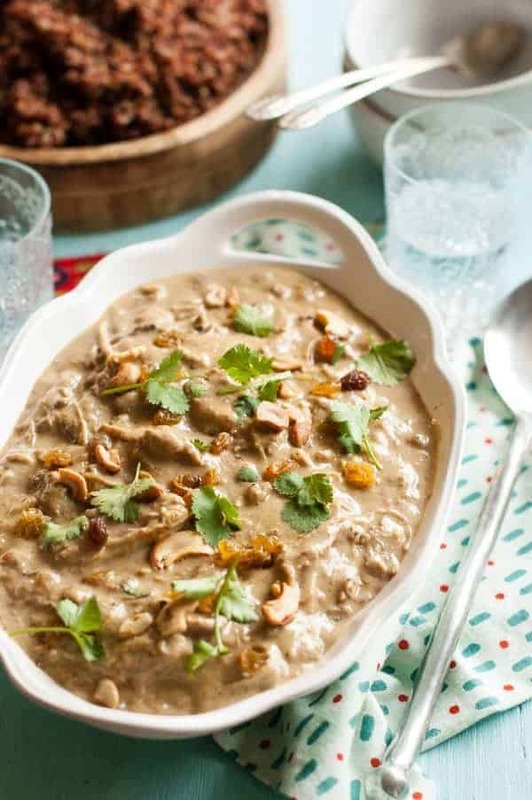 An Indian chicken dish with cashews, coconut and golden raisins. Place the cashews and coconut in a bowl and cover with an inch of water. Let soak overnight, or for at least 4 hours. Drain and place in a high speed blender. Puree until it becomes a smooth paste. Add in the coconut milk and puree until smooth and combined. Set aside. In a large, oven-safe frying pan with high sides, heat the oil on high. Season the chicken thighs with salt and pepper. Place in the hot oil in the frying pan and cook each piece on both sides, until golden brown. Reduce the heat to medium/high and add the onion, cumin, turmeric, garam masala, and ginger. Saute for 2-3 minutes, or until onion is translucent. Add the garlic and saute for another 30 seconds. Add the chicken back into the pan along with the golden raisins. Pour the chicken stock into the pan and bring to a simmer. Cover. Place the pan in an oven preheated to 325 degrees. Cook for 45 minutes. Add in the cashew/coconut sauce and cook for another 45 minutes, or until chicken is tender. Shred chicken lightly. Check seasonings and add more salt, if desired. Garnish with cilantro, cashews, and golden raisins. Serve atop red quinoa or cauliflower rice. *If at any time during the baking process you feel the liquid levels are too low or the sauce is too thick, add in another 1/2 cup of chicken stock. 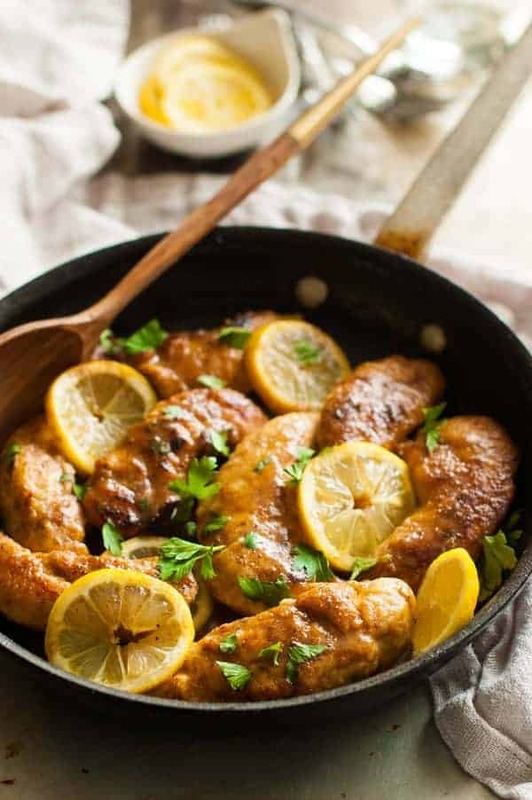 I’m so in love with this Clean Eating simple chicken korma. It’s so good and only takes a few minutes to get it started and then most of the rest of the time I can do whatever I want while it cooks. Put all the main ingredients and spices in a oven-safe frying pan with high sides or an enameled dutch oven. Put the spices on both side of the chicken. Pour the can of coconut milk into the pan and bring to a simmer. Cover. Place the pan in an oven preheated to 325 degrees. Cook for one hour, or until the chicken is tender. Shred chicken lightly. Check seasonings and add more salt, if desired. Add cashews, coconut flakes and ginger. Garnish with cilantro. Serve atop red quinoa or other grain, such as rice. Jasmine rice is my favorite, although not strictly Clean Eating. I also really like short grain brown rice and mashed cauliflower with this dish. Put the main ingredients, coconut milk and spices in the Instant Pot. I always use frozen chicken and they have enough moisture that I don’t add water, but I would guess with fresh chicken you will need to add a little water. Add as little as possible so the spices will brown. Push the Soup button and let it cook for 30 minutes on high pressure. Let the steam out. The chicken should be super soft. If not, cook for a few more minutes. Shred chicken lightly. Check seasonings and add more salt, if desired. Add cashews, coconut flakes and ginger. Garnish with fresh cilantro and serve over a grain, as mentioned above. Question; do you leave skin on the thighs for this recipe? Thanks! No. I use boneless, skinless chicken thighs. Thanks for asking. I didn’t realize I forgot to specify that on the recipe. It’s all fixed now! This is one of my favorite “show off” dishes and it’s going to be just perfect on this snowy midwestern evening! I think I’m going to serve it with peas and cauliflower over red quinoa. Hi – I’m just wondering why cook the chicken twice 45min each? It should’ve been cooked much shorter than that? It will be cooked before that and you could cook it shorter than that if you want, but cooking it that long makes it really nice and tender. Can this be made just on the stove top without the oven bit? Yes. The oven helps give it a nice roasted flavor and cooks it all through, but it’s not necessary. Rebecca, you are truly a gifted chef! Thank you so much for this recipe! It was sooooo delish! I can’t make it that often because it’s just me myself and I, but I can definitely see making this quarterly throughout the year! This is delicious and the best homemade curry I have ever made. So easy and filling.Will definitely make it again. I’m so glad you like it! Thanks for taking the time to comment. This was wonderful! Made it tonight and was asked by my family to make it again. A win. thanks! So good to hear! I’m glad you liked it. I’ve eat it so many times and it tastes a little different every time. Lately I really like it with steam cauliflower. Do you leave the skillet uncovered for the second 45 minutes after putting in the sauce? I made this the other night and it was delightful! I will totally make this again soon. Didn’t change any aspect of the recipe and wouldn’t a second time around, either. Thanks for this gem! I am glad you enjoyed the recipe!